Please welcome contemporary romance author Celia Juliano! 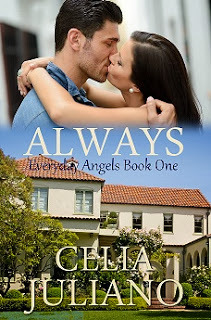 She's here to talk about her novella, Always, the first book in her Everyday Angels Series and right now, it's only 99¢! In fact, all 5 of her books are only 99¢ through November 30! So, be sure and check out the blurb and excerpt for Always below. Gina D’Angelo comes home to San Francisco with one plan—to save her family’s ailing business by uncovering the truth about the DeGrazias. But her plan goes up in flames when her attraction to Vincente burns out of control. After a night together, Gina and Vincente struggle to discover the truth about each other, and to solve the decades-long conflict between their families. As Vincente realizes he needs Gina in his life, Gina sees that Vincente isn’t the man she thought he was—and they’re ready to fight for their always, together. Gina crossed the room, stepped out and onto a patio. Potted palms rustled in the breeze and muffled the sounds of traffic from the surrounding streets. The chill night air nipped at her. She rubbed her arms. The city stretched before her, as curvaceous and alive and varied as the women inside. The skyline twinkled, the San Francisco Bay shimmered in the distance. She closed her eyes and exhaled. Home, she was finally home. She hugged her arms. “Cold?” a man’s deep, intense voice said. A soft but weighty coat draped around her shoulders. She warmed and pulled the coat closer. Then her back tensed. What was she doing? Some stranger was trying to pick up on her—again. This one was doing the gentleman bit. She turned. Vincente DeGrazia stood in front of her. Her body tingled, not from the cold, but from his intensity. His steady gaze took her in, his short black hair and clean-shaven, square-jawed face, along with the tux, made him seem even more the gentleman. His body, almost stocky, but lean—an athlete’s physique—increased the sizzle crackling through her. No. She stepped back, pressed into the railing. Every time she felt this way, it ended in disaster. Because, every time, she’d fallen for cheaters, liars, womanizers. He ran his finger under his collar. Damn, he reminded her of her favorite actor crush, the guy who’d played Lorenzo Alcazar on “General Hospital,” all those years ago, when she used to watch with her Grandma Valeria. She turned again and lifted her mask to dab at her eye. She wouldn’t cry, no matter how much she missed Grandma, no matter how messed up her life had gotten. Vincente touched her shoulder. She almost gasped from the sensation—a lit fuse speeding its way to exploding. Celia Juliano learned to read at the age of two, beginning her lifetime love of books, especially those with a happily ever after. She grew up believing in fairies, angels, Santa Claus, and the true love of an Italian prince. Now she writes about everyday angels and Italian American men...as well as other stories of relationships, minor miracles, and happy endings. A native Californian, she lives in the San Francisco Bay Area. Celia loves to hear from readers--you can reach her on Twitter, Facebook, Goodreads, or her website, celiajuliano.com.